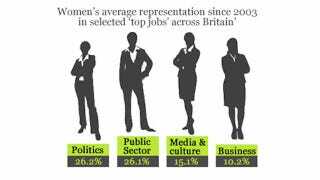 A new report from the British Equality and Human Rights Commission, examining women's representation in top roles, shows that some indicators have worsened and others have improved. In other words, "It is a trend of waxing and waning; not one of constant upward movement." What does this mean for how we think of social change? Here is one clearly linear movement, according to the report: "British women are better educated than ever before. They are attending university in ever increasing numbers and achieve better degree results than men. Intelligent, competent women are flooding the junior ranks of law firms, accountancies and medical practices." But thanks to familiar factors identified by the study, including different domestic expectations for women with children, the picture is different at the top. The study counted 26,000 positions of power in fields like business, government, media, and the judiciary. Some of the fields have shown improvement since the last report; other have lessened representation. The authors calculated how long, at the current rate of progress, it would take to achieve complete parity. By this formulation, there are 5,400 "missing" women at the top, and it would take another 30 years for there to be as many women in the ranks of "senior police officers," 70 years for directors of major corporations, 45 years for the senior judiciary, and 70 years for the parliament. The study is assuming again here that there'll be a linear progression, even though the authors themselves describe a waxing and waning. But maybe instead we need to be asking, here and elsewhere, why might things get worse again after getting better? Is it a cycle of progress and backlash? Is there inertia about social change that allows things to slacken and go back to the way things were?